When Americans think of poultry, chicken is far and away the first thing that comes to mind, followed by turkey. While pheasants have been available in the United States since the late 18th century, this bird is still considered a rather exotic poultry option along the lines of squab (pigeon), ostrich, and quail. In order to be considered poultry, an item must not only be a bird species, but it has to be domesticated or farmed. Wild game is not considered poultry unless it is the domesticated variety. Cooked pheasant tastes vastly different depending on whether it was farm-raised or was hunted in the wild. Farm-raised pheasant is said to taste like chicken, only richer, while wild pheasant typically has a stronger and gamier flavor. Unless you have hunted it yourself, in all likelihood, the pheasant you get in the store or from a local butcher is the farm-raised variety. To cut any lingering gamy flavor, you might consider soaking the pheasant in salt water (as detailed in this recipe), as it cuts any gaminess, and cook the bird in a marinade to help keep it moist. Although originally from Asia, pheasants are now found across the globe due to their readiness to breed in captivity and since the bird can naturalize in many climates. 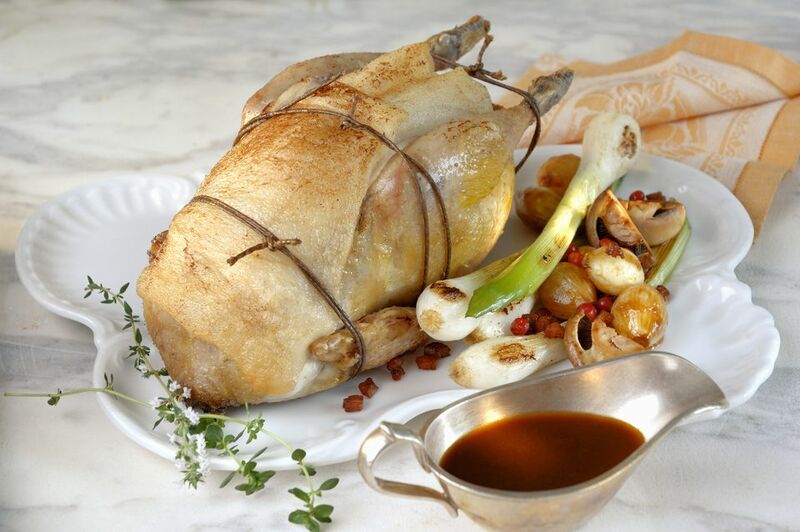 It has been known to be a popular game bird since the time of the Stone Age humans. Place the pheasant in a large bowl with salt and cover with water. Let the bird soak for 1 hour, then drain and rinse. Combine the soy sauce, Worcestershire sauce, brown sugar, garlic (if you are using it), liquid smoke, Tabasco sauce, vinegar, and onion powder. Put the pheasant and the marinade in large, non-reactive container and refrigerate for at least 2 hours. Stir the marinade occasionally to keep pheasant coated. Discard the marinade and transfer the pheasant to a slow cooker. Add 1/2 cup of water or chicken broth. About 30 minutes before the pheasant is done, coat it with barbecue sauce, if desired. Best side dishes: Since pheasant is really a variation on chicken or turkey as far as flavor goes, the sides that go best with chicken or turkey also go well with pheasant. Mashed potatoes, white rice with sauteed mushrooms and onions, rice pilaf, barley, or roasted russet potatoes all make great side dishes. Steamed fresh broccoli, corn or steamed fresh green beans tossed ​in olive oil and seasoned with garlic and Parmesan are compatible vegetable choices. Bread selection: Buttered French bread is always a good addition to a poultry entree. Suitable wine pairings: Pair roasted pheasant with a dry white wine like chardonnay, sauvignon blanc, or pinot grigio. If you feel a bit adventuresome, try Spanish Albarino or Italian Orvieto.